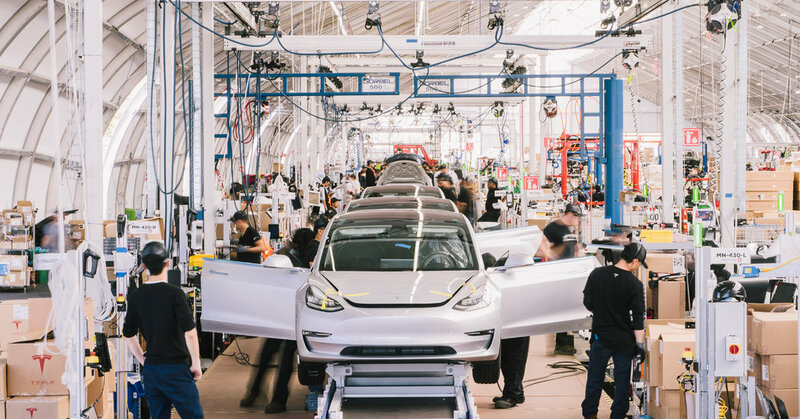 Tesla is reducing its full-time work force by 7 percent as it tries to lower the cost of making its Model 3 sedan, the company’s chief executive, Elon Musk, told employees on Friday. Tesla also plans to ramp up production and improve the design of the electric car, which currently costs $44,000 for its most affordable version, Mr. Musk said in an email. “There isn’t any other way” to “achieve the economies of scale” necessary to sell the Model 3 for $35,000 while remaining viable, he wrote. Tesla stock slumped more than 8 percent in premarket trading on the Nasdaq stock exchange. Another one of his companies, the private rocket maker SpaceX, also said this month that it was cutting about 10 percent of its work force. Tesla recorded its first quarterly profit in two years, and its largest ever, in its third quarter, aided by cost-cutting, delayed payments to suppliers and a surge in production and sales. The company expects to earn a smaller profit in the fourth quarter, based on preliminary, unaudited results cited by Mr. Musk. The electric-car maker lowered prices on all of its vehicles by $2,000 this month as a federal tax credit for its vehicles — worth $7,500 last year — began to phase out. The company can keep only crucial contract workers as it faces the challenge of making its products competitive with vehicles that run on fossil fuels, Mr. Musk wrote. “While we have made great progress, our products are still too expensive for most people,” he wrote. As the company’s struggled to meet its manufacturing and financial targets, Mr. Musk’s behavior caused distractions. In August, he wrote in a short, cryptic post on Twitter that he was thinking about taking Tesla private and had secured funding, surprising board members and driving up the stock price. The Securities and Exchange Commission later sued him in federal court, saying that he had misled investors. Mr. Musk settled with the agency, agreeing to pay a $20 million fine and step aside as chairman for three years.